An ancestor of my previous life played a leading role in the events at Montségur in March 1244. The cream of their defence soldiers were the crossbow archers. L’arbalète, or the crossbow, was a sophisticated and deadly weapon and invaluable in the defence of Montségur; Raymond de Péreille made sure the weapons were kept in good condition. The arbalétriers were specialised soldiers and by 1240 their commander, Domergue, was training others to assist the two sergeants, one of whom was called Arnaud Gasc. The other was called Guillaume Azéma. An Azéma at Montségur, this famous place of Cathar history! I felt I had uncovered an ancestor. We wouldn’t know anything about Guillaume Azéma if he hadn’t been a Cathar. So where did he come from? Who were HIS ancestors? To the south of Mirepoix in the valley of the Hers river, is the village of Vals, reputed to be the prettiest village in Ariège. The church - L’église rupestre - is built over a cave in the rocks and thus is partly underground. 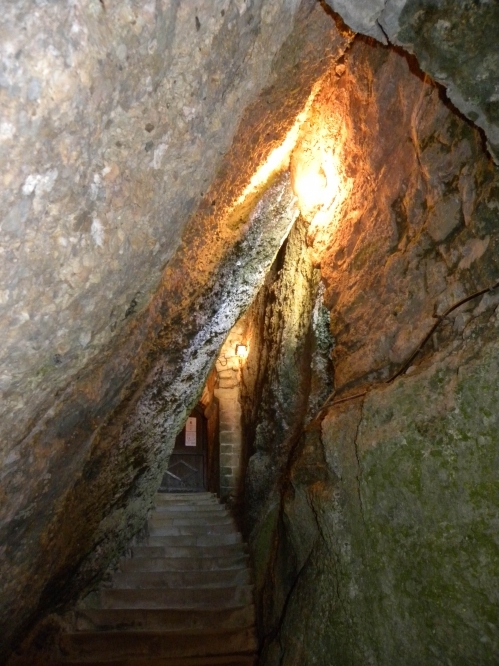 One enters the church through what is apparently an entrance to a cave in the rock. The cave has been in use for a long time; Iron Age, Roman and Visigothic remains have been found there. It became the crypt in the eighth century and described as Pyrenean in style. It became a priory, classic for its time; there were also priories in Foix, Pamiers and Camon. The nave was built in the 10th century, the chancel in the 11th century, the single-bell belltower in the 12th century. In Cathar times this Eglise Rupestre was a sanctuary or “safe house” on the Cathar route from Spain, which passed by Montségur, some 15 kilometres to the south. From 1209 to his death in 1227, the seigneur or Lord of Vals, Guillaume Azéma, a knight, assisted Cathar preachers in Mirepoix. Above the altar of his church are clearly seem the remains of a series of frescos done sometime before 1200. They were Catalan in style and show classic biblical scenes including Christ handing St. Peter the keys to his kingdom; can we assume they were done by fellow Cathars from the Pyrenees? The Cathars were quite keen on the Saints Peter and Paul. There’s a mystery about these frescos; they were renovated in 1956, having been discovered in 1952, under “several layers” of rendering. Who had covered them up and why? Guillaume Azéma who was at Montsegur by 1240, trained as a crossbow archer, was the son of the Lord of Vals, with the same name. The winter of 1240 to 1241 at Montségur was hard. The soldiers acted as escorts for Perfects as they went about the countryside converting and preaching. The king of France, Louis IX, asked Count Raymond VII of Toulouse to fight Catharism by destroying Montségur. But Raymond himself was Cathar and throughout his life he, as his father did before him, tried tragically to obey the King and the Pope while still looking after his own people. So he drew up his troops at the foot of Montségur; and after a few days retreated - it was a token gesture. As a result, in 1242 feelings against the Catholics ran hard. The Cathars, against the teachings of their religion, launched a military operation. Under Pierre-Roger of Mirepoix a group of men and soldiers, which included Bernard Othon from Usson, moved under cover of darkness to Avignonet in the Lauragais and slaughtered members of the Inquisition. In May 1242, before he went to Montségur, Guillaume Azéma was a companion at arms to Pierre-Roger of Mirepoix, and he too joined the knights to ride to Avignonet to massacre the Inquisitors. A possible ancestor of my previous life, and a medieval nobleman who had owned the castle Usson so beloved by my friend David, were together in this mission. Coincidence? Everybody was connected. Again I had the feeling that I was meant to come to Languedoc; maybe the me that was Jules had given the second me a mission? To preserve his name, to discover unknown history? Click here for a beautiful film about Vals Rupestre. It is in French; here's a précis of the commentary. Everything here is austere, it seems like a castle on a rock and it was a sanctuary. The "little people of the country" have been praying here for over a thousand years in the womb of the earth. To enter is astonishing and secret. The path passes up through the rocks to enter the church more than one thousand years old. Continue to the chapel of Ste Marie for an explosion of colour. The frescoes enable us to sense the spirituality of the Middle Ages. Go up another corridor to find daylight. In the tower of we find the chapel of St. Michel; it was to protect Ste. Marie, the mother, the womb of the earth. The beseigers at Montségur commissioned mercenaries from neighbouring villages to do their fighting for them - but these mercenaries were Cathars, and played a double game. Messages, supplies and reinforcements continued to reach the Cathars of Montségur. Gamely, optimistically, they held out and held on, hoping Montségur was not beseigeable. But somehow, at Christmas 1243, the besieger Hughes des Arcis paid some Gascon mercenaries to climb the eastern end of the mountain under cover of darkness and make a surprise dawn raid. They were beaten off but the fighting was serious, and several knights and soldiers were wounded, including our friend Guillaume Azéma. Those Cathars who died in the fighting were buried within the citadel; their graves were found during excavations in 1965. The wounded soldiers were cared for by the Cathars, and were much impressed by their kindness. We know that Guillaume Azéma recovered. But it was obviously, the beginning of the end. 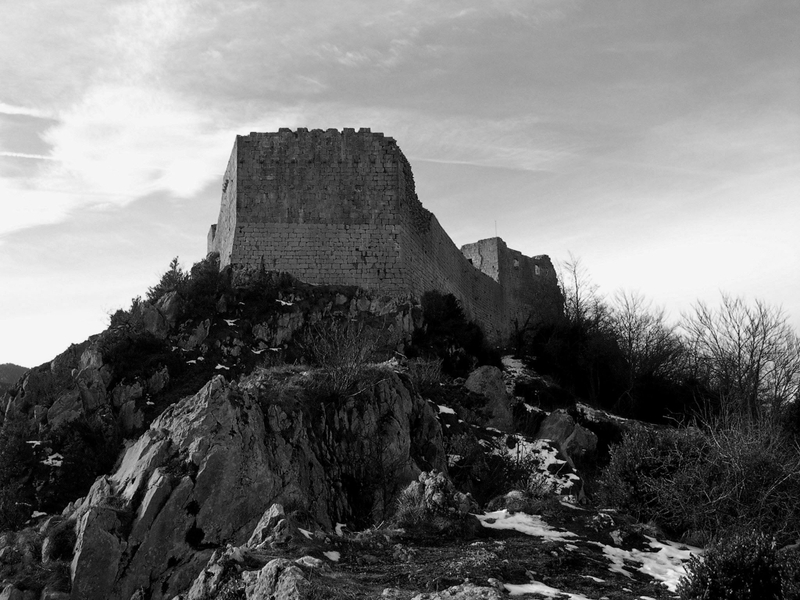 The Cathars started to negotiate a surrender in February 1244. Pierre-Roger of Mirepoix asked for a period of grace of fifteen days before the attackers moved in, so the soldiers, knights and simple believers could go free. During the first week of March, Pierre-Roger organised the food supplies, and Guillaume Azéma was sent to get oats, pepper, oil, salt and wheat. Why the fifteen days? Were they still expecting reinforcements? No one really knows. Maybe they simply wanted time to give everyone the consolamentum, and release what friends they could. The Cathars spent the time in saying goodbye and preparing for death. They gave all their material possessions away to the soldiers who had defended them for ten months. These were personal possessions, rather than wealth, although the writer Zoé Oldenbourg thinks it possible that some religious relics were given as well. The lady Perfect Raymonde de Cuq gave a sack of wheat to Guillaume Azéma. As there’s no record of him receiving the consolamentum, when the siege was ended, as a mere soldier, he was probably allowed to leave to go back to Vals. Two Azèma families were at Montaillou, the last Cathar village, about sixty years later. I believe they were descended from Guilliame. This unknown history is all in my book. Go to "Home Page" at the top of the site for further details. REINCARNATION - is it true? Compare modern with original Occitan Music.